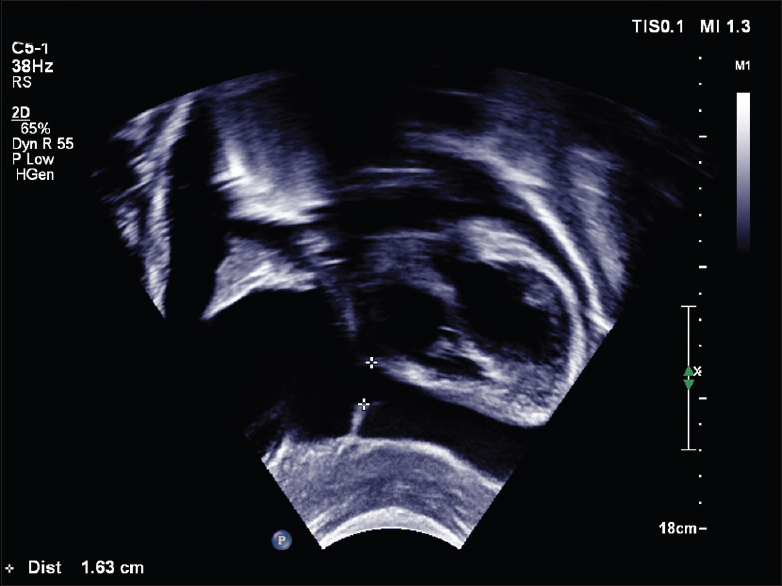 We present a case of a 9-year-old girl with an atrial septal defect (ASD) who developed a massive pericardial effusion and right pleural effusion 6 days after an uneventful surgical closure. Our patient was incidentally detected to have 32 mm secundum ASD with deficient postero-inferior margin. Pericardial patch closure of the defect on cardiopulmonary bypass through the right posterolateral thoracotomy was uneventful; she was shifted to the ward on the 2nd day after chest tube removal. Although she remained asymptomatic, predischarge echocardiogram on the 6th day showed no residual ASD, good ventricular function, a massive pericardial effusion, and right pleural effusion, with the heart swinging in the pericardial fluid space [Figure 1] and [Video 1]. A communication created between the right pleural and pericardial cavities during the postero-lateral thoracotomy served to reduce the pericardial pressures in spite of holding 1.2 L of fluid. 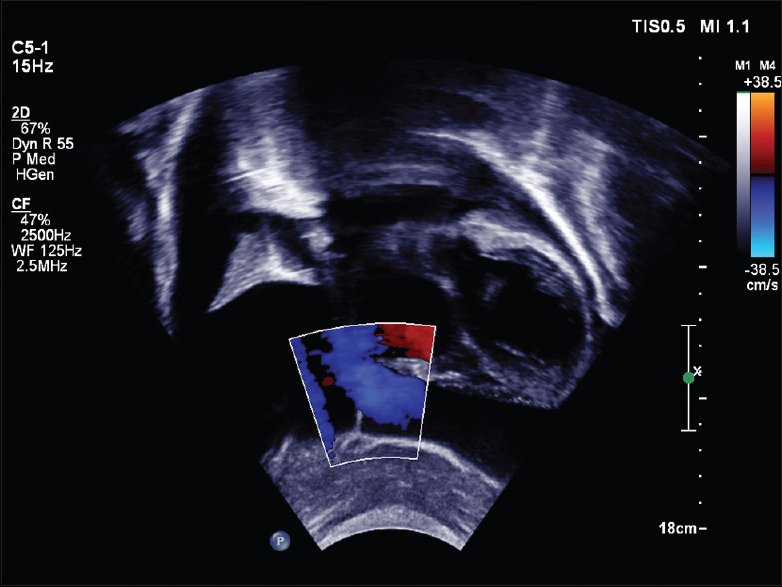 When intrathoracic pressures fell during inspiration, color Doppler indicated the movement of pericardial fluid into the pleural cavity [Figure 2] and [Video 2]. This inspiratory reduction in pericardial volume permitted unhindered systemic and pulmonary venous return. There was no right atrial or ventricular diastolic collapse, and mitral and tricuspid flows were normal [Figure 3] and [Video 3]. After aspirating sanguinochylous fluid with high triglyceride levels using a percutaneous pigtail catheter and dietary modifications, she was discharged home the next day. There was no recurrence at 1-week and 1-month follow-up. The nature of fluid and relief after single aspiration indicates the etiology being small vessel and lymphatic injury during dissection. 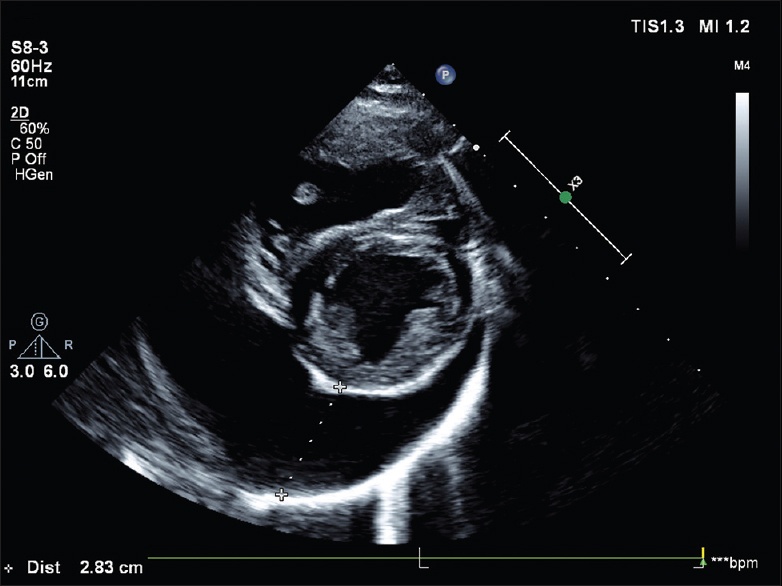 Large pericardial effusions rarely follow open-heart surgery and may present with tamponade. In rapidly accumulating pericardial effusion, pressure–volume curve becomes steep and symptoms set in. Rapid accumulation may increase intrapericardial pressure with as little as 80 ml while slowly progressing effusions can grow to 2 L without symptoms. Tamponade is hallmarked by equalization of diastolic filling pressures to pericardial pressures. When the intrapericardial pressure is high, the inspiratory augmentation of venous return can only be accommodated by the shift of septum with proportionate reduction in the left heart filling and left ventricular stroke volume. The large pleuro-pericardial communication in our patient allowed shift of pericardial fluid to pleural space during inspiratory fall of intrathoracic pressure and prevented any impediment to venous returns. This effect has been utilized often in malignant pericardial effusion to prevent tamponade. Pleuro-pericardial windows were surgically created in such effusion; sometimes, balloon pericardiostomy was followed. Ashikhmina EA, Schaff HV, Sinak LJ, Li Z, Dearani JA, Suri RM, et al. Pericardial effusion after cardiac surgery: Risk factors, patient profiles, and contemporary management. Ann Thorac Surg 2010;89:112-8. Calvin JW, Stemmer EA, Steedman RA, Connolly JE. Clinical application of parasternal mediastinotomy. AMA Arch Surg 1971;102:322-325.